John Byng was born in Bedfordshire, England in 1704, the son of the first Viscount Torrington, and Admiral of the Fleet. He joined the Royal Navy in 1718 and became a lieutenant in 1724. In 1727 he was promoted Captain of the Gibraltar, and was stationed in the Mediterranean for the next 12 years. In 1742 Byng was appointed Governor of Newfoundland. Interested in Newfoundland trade, he appointed William Keen, Jr. as Naval Officer to monitor imports and exports and watch for illegal trade. He reported to the Board of Trade that the island was monopolized by several merchants who bought whole shiploads of cargo and resold it at largely inflated prices. Byng tried to stop this practice but was unsuccessful. Byng protected the fisheries from foreign incursions, reported on the cod and salmon fisheries, on the inhabitants' living conditions, and on the presence of Irish Catholics. 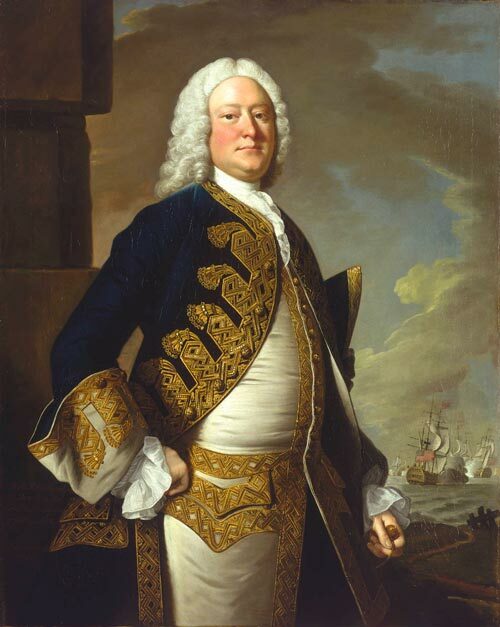 Byng was promoted Rear-Admiral in 1745, and Vice-Admiral and Commander-in-Chief in the Mediterranean in 1747. In 1751, he was elected to Parliament for Rochester. When promoted Admiral in 1756, he was sent to the Mediterranean to guard the British island of Minorca from French attack. Upon arrival, he found the fort taken by the French and retreated. Byng was arrested, tried by court-martial for negligence, and was executed by firing squad on the Monarch at Portsmouth, on March 14, 1757. It was, as Voltaire remarked, "pour encourager les autres."